The Motorola DROID RAZR HD and RAZR MAXX HD are no longer new by smartphone standards, having been released back in October of last year. So typically when a phone has been on the market for five or six months, we start to see the price drop across the web. 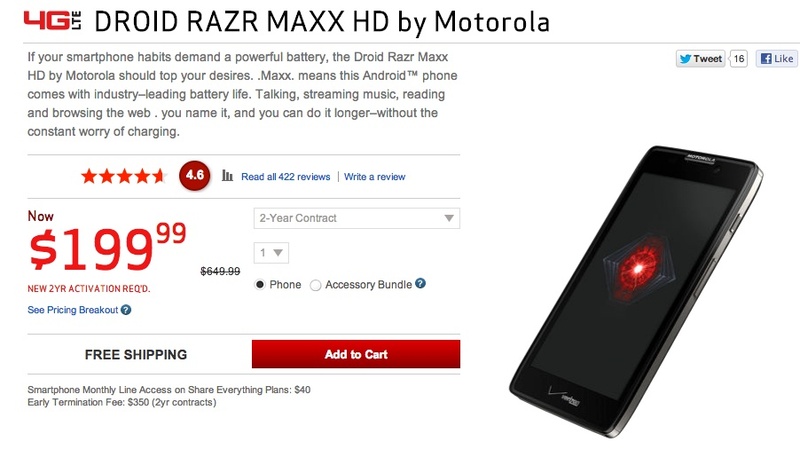 In what appears to be a recent discount, Verizon has slashed their prices of the RAZR HD line. You’ll find the regular RAZR HD for $99 followed by the RAZR MAXX HD for $199 on new 2-year contract. As many of you know, the only different between the two in terms of specs are the amount of internal storage and the battery size. The MAXX HD has 32GB of internal (16GB in the regular HD) and a 3300mAh battery (2530mAh in the regular HD). But if $199 and $99 are cheap enough, you may want to look into Amazon, which is listing the RAZR MAXX HD at $99 and the RAZR HD for a penny. And no, I don’t necessarily believe this is a sign that the X Phone is just around the corner.